in the picturesque village of Horning. 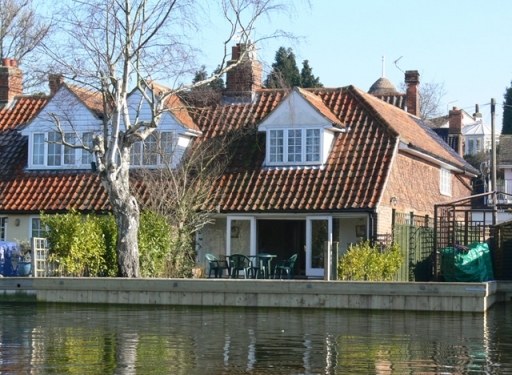 Riverbank offers accommodation for six guests and parking for two cars. The garden faces south, so it is light and sunny in summer, cosy in winter. The large comfortable sitting room has French windows leading to the garden with patio area, lawn and riverside decking where you can fish (in season with a fishing licence) or just relax and enjoy the views along the river. The kitchen is equipped with a dishwasher, microwave, washing machine, fridge and dual fuel range cooker. The master bedroom contains a king-size bed, the second bedroom has a double bed and connects to the third bedroom with two single beds. Riverbank has full gas central heating and a bathroom located upstairs. The local village has a grocery store, post office, butcher, antique shop, several pubs and restaurants. The North Norfolk coast is about 30 minutes drive, and offers sandy beaches, seal watching at Blakeney and seafront amusements at Cromer. Ten minutes drive away is Bewilderwood and about 30 minutes drive is Pleasurewood Hills theme park, near Great Yarmouth.